The ancient Japanese art form of growing Bonsai trees is fascinating. 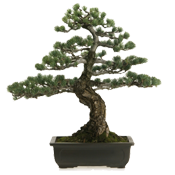 Bonsai trees are essentially normal shrubs that have been consistently stressed in a particular way for a long time to create a posture which would never be found in nature. Depending on how the tree is stressed while it grows, it may end up looking like a miniature version of a full-sized tree, or it may end up looking like a wild tangle of branches with twists and loops. To most people, "good posture" simply means sitting and standing up straight. Few of us realize the importance of posture to our health and performance. The human body craves alignment. When we are properly aligned, our bones, not our muscles, support our weight, reducing effort and strain. The big payoff with proper posture is that we feel healthier, have more energy, and move gracefully. So while the word "posture" may conjure up images of book-balancing, charm-school girls, it is not just about standing up straight. It's about being aware of and connected to every part of your self. Posture ranks right up at the top of the list when you are talking about good health. It is as important as eating right, exercising, getting proper rest and avoiding potentially harmful substances like alcohol, drugs, and tobacco. Good posture is a way of doing things with more energy, less stress and fatigue. Without good posture, you cannot really be physically fit. Without good posture, you can actually damage your spine every time you exercise. Ideally, our bones stack up one upon the other: the head rests directly on top of the spine, which sits directly over the pelvis, which sits directly over the knees and ankles. But if you spend hours every day sitting in a chair, if you hunch forward or balance your weight primarily on one leg, the muscles of your neck and back have to carry the weight of the body rather than it being supported by the spine. The resulting tension and joint pressure can affect you not only physically, but emotionally, too - from the predictable shoulder and back pain to headaches, short attention span, and depression. Poor posture distorts the alignment of bones, chronically tenses muscles, and contributes to stressful conditions such as loss of vital lung capacity, increased fatigue, reduced blood and oxygen to the brain, limited range of motion, stiffness of joints, pain syndromes, reduced mental alertness, and decreased productivity at work. According to the Nobel Laureate Dr. Roger Sperry, "the more mechanically distorted a person is, the less energy is available for thinking, metabolism, and healing." The most immediate problem with poor posture is that it creates a lot of chronic muscle tension as the weight of the head and upper body must be supported by the muscles instead of the bones. This effect becomes more pronounced the further your posture deviates from your body's center of balance. To illustrate this idea further, think about carrying a briefcase. If you had to carry a briefcase with your arms outstretched in front of you, it would not take long before the muscles of your shoulders would be completely exhausted. This is because carrying the briefcase far away from your center of balance places undue stress on your shoulder muscles. If you held the same briefcase down at your side, your muscles would not fatigue as quickly, because the briefcase is closer to your center of balance and therefore the weight is supported by the bones of the skeleton, rather than the muscles. In some parts of the world, women can carry big pots full of water from distant water sources back to their homes. They are able to carry these heavy pots a long distance without significant effort because they balance them on the top of their heads, thereby carrying them at their center of balance and allowing the strength of their skeleton to bear the weight, rather than their muscles. Correcting bad posture and the physical problems that result can be accomplished in two ways. The first is by eliminating as much "bad" stress from your body as possible. Bad stress includes all the factors, habits, or stressors that cause your body to deviate from your structural center. Bad stress can result from a poorly adjusted workstation at work, from not having your seat adjusted correctly in your car, or even from carrying too much weight around in a heavy purse or backpack. The second is by applying "good" stress on the body in an effort to move your posture back toward your center of balance. This is accomplished through a series of exercises, stretches, adjustments, and changes to your physical environment, all designed to help correct your posture. Getting your body back to its center of balance by improving your posture is critically important to improving how you feel.